International - janartomlofts jimdo page! Vandenabeele Gaby, "Undisputed the best Belgian Long Distance Racer!" No one in the whole of Belgium had such a fantastic season in oneday long distance racing as Gaby Vandenabeele. This 53 years oldaccountant / book-keeper is ruling on races from 300 up until 800 kilometres week in week out. In de province of Western Flandres the fastest fifteen birds are published on Teletext and almost every week Gaby Vandenabeele was amongst these quotations. Sometimes even with three birds!! Racing only a hand full of birds, this achievement is by far not easy, but for Gaby it became almost an insurance, because his strain of birds proved to be the absolute top from the early eighties on. - in 2002 he again won National Bourges. His ‘James Bond’ (NL01-3031007) left behind 13,166 yearlings. From such a grandmaster something can always be learned. We asked Gaby some questions. Gaby, can you tell us how you composed your strain? ‘I build a new house in 1976 and started to race my first birds than. 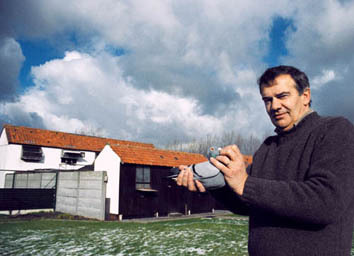 The first birds to house my loft came from my dad Gentiel, in his glory years a very strong middle distance racer is the west of Flandres, one of the strongest centres of Belgium. The birds of my father originated from famous lofts like Valere Desmet-Matthijs (Nokere, Belgium), Pol Bostijn (Moorslede, Belgium) and Lucien Verstraete (Deinze, Belgium). In my early years I participated on the races without owning any breeders for about five years. My fathers stock got the biggest share in forming by own strain. In 1981 ‘Kleinen’ (B81-3238253) was born, I moved him to breeding loft right away. Circumstances and luck were on my side than, because what was the case? His sire, 'Zitterke' (B80-4055428), I borrowed from Jozef Delodder from Zulte, after he won a first prize from Orleans with very hot weather and the winds on his head. I had this cockbird at my disposal for a short while and unfortunately I had no good enough hen from my own stock available for this cockbird. I was lucky to get help from my friendGilbert van Parijs (now loft manager for Norbert and Filip Norman, FE). He offered me to pair one of his best hens called ‘Ameyke’ (B77-3064419) to ‘Zitterke’. ‘Kleinen’ is the best breeder I ever had. He is amongst others sire to 'Picanol' (B82-3258240), best provincial acebird on middle distance 1983 and sire to 'Sissi', the number one breeding hen from Ad Schaerlaeckens. 'Fideel' (B83-3105147), a direct descendant to 'Kleinen' too, won 7 x 1st and 2nd Nat. Limoges. I was unlucky to loose this bird on Poiteirs. Another toppers is‘Wittenbuik’ (B88-3206112), a direct son to ‘Kleinen’. He already listed three provincial victories and was beaten by a loftmate once. And he appeared to be a super breeder. 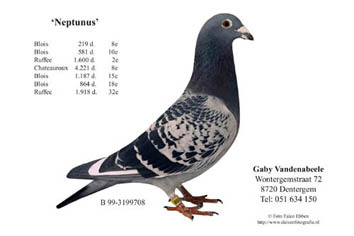 Especially Koen Minderhoud has phenomenal birds from the 'Wittenbuik'-lines. In the early eighties you were a very successful middle distance racer. Why did you set your goals in racing long distance? Is my conclusion that your birds can race top on every distance therefor justified? What do you find important in selecting your birds? ‘Birds that win a 1st prize on a race with 1,800 meters a minute velocity, do not make me enthusiastic. With such a velocity every bird can win a 1st prize. The good birds win top prizes with head-winds. About ten years ago I had a bird, that won 3 x 1st on 300 km races with 1,800 meters a minute. But when the distances grew bigger and races were getting heavier, he always came in late . . . I removed him from my loft. I must say, not all birds are capable of racing oneday long distance. 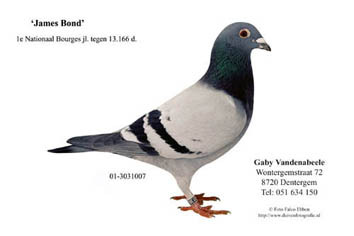 The Antwerp Union is world-famous in pigeonsport. They probably own the best bird for races up until 400 km, but if you are looking for 500-600 km birds, I think this is not the place to be. Because after 400 km they are out of fuel. In Western Flandres we race long distance every week. They are trained on this . . and tested! When I look for birds to strengthen my loft, I usually buy birds based on my own bloodlines. Last year the best young acebird long distance and best acebird middle distance in the Western Flandres were 50% Vandenabeeles. I bought them both. My biggest concurrence is racing my birds and I am pretty proud at that. Must a bird have certain outer characteristics according to you, or do you only base your judgement on results? Do you believe in the eye-theory? How are your birds brought towards the season? ‘I only race with cockbirds on widowhood. I used to put them on widowhood without nursing any youngsters, but now I let them bring up one round of youngsters before the season. I put the eggs of my breeders under my racers, so I can breed more from the breeders. I have two lofts at my disposal for the widowhood cockbirds. I used to put one loft on widowhood without nursing any youngsters, while the other section brings up a round of youngsters. My experience was that the last group had much better results, therefor I quit the method of not nursing any youngsters. ‘Do you show the hens before the race?? How many times a season do you race your birds? What is your daily schedule with the birds? Tell me something about your feeding system. Can you tell something about the composition of this mixture? ‘Of course, no problem. It is composed from 31% maize, 20% white soudan dari, 20% paddy rice, 2% kadjang itjoe, 1,9% white wheat, 1% barley, 1,6% pealed oats, 1,6% Australian milo, 0,3% turnip-seed, 0,3% linseed and 0,3% bucwait. Do you often visit a veterinary surgeon? And what about Sedochol, that is so popular in Belgium at the time? ‘If things are not going as I want them to, I sometimes give Colombine tea. I always ad one spoon of honey to make it a big more tasteful. But most important is good food. I can put any kind of food or any quantity on my loft, and still the birds do not get fat. This summer I once put a little pot with Vitamineral on my loft and it is still there. They do eat some peck-stone, but that does not cost me that much. If I place such a red peck stone on my loft, my thirty breeding pairs have enough for a week. An explanation I can not find, maybe it is the food or the water, that I still draw from a well. I want no water from the city. A good bird is in the first place a healthy bird. You should not keep it healthy with pills. ‘Before the racing season all my birds are treated with a full cancer cure. Besides, once a month all my widowers are given a tablet against cancer. In the past I preventively cured against paratyphus, but if the birds are healthy, it is best not to treat them. Nowadays I'm having the droppings tested. If something is wrong, they are given medicines, otherwise never. It is said the birds infect each other through the drinking water, but at my place this is not an option, because drinking water is given to each bird separately. By the way, I think ornithosis is 'wandering around' in a loft. Therefor I am convinced of the good influence of the Koudijs dry-disinfector; it kills everything. Tell me something about your lofts . . .
‘All my lofts are situated with the front at south-east. At the front I have two widowers-lofts, on the back the breeders and youngsters are housed. The bottom and the side-walls are isolated. Behind the wooden plates there is a layer of 5 centimetres isomo. On the outer side I made plates of synthetic material in the colour white. This colour ensures the loft not getting too hot in summer. On the inner side I added a bit of blue colouring pigment to the white paint. This is less sharp for the eyes and I expect it to have a peaceful effect. You can supply the birds with too much or too less fresh air. I noticed that too much fresh air in spring also cools things of too much. Therefor I closed the openings under the roof at the backside. I live pretty close to the sea and sometimes the winds are very hard here. The air-opening at the backside caused too big a supply of fresh air. I know many champions are very sceptical about the supply of air on the bottom of the loft. Their concern is many times justified, it can cause too big a supply of fresh air. I barricaded the little grates under the windows from the inner side with a plate bigger than the opening. The plate is a few inches away from the opening. The air can get in therefor, without entering in too much a quantity. I think the best lofts are never that big. In my opinion a loft should not be wider than two meters. The lofts of my widowers are only two meters wide and the climate is always good. My youngsters are housed in a loft 2,80 meters wide, and I am having the biggest problems with draught and such in there. The bigger the loft, the more circulation of air. The temperature is hard to get up then and the lofts cool down a bit too fast. Chateauroux : 386 old birds: 1, 4, 5, 6, 8 etc. Angoulème : 296 old birds: 2, 3, 10, 13, 20, 25, 34.
provincial he started with position 8 and 10 against 3,346 birds. 7 prize cards from 14 basketings. Chateuaroux : 583 yearlings: 1, 2, 3, 4, 5, 6, 10, 11 etc. provincial against 7,347 birds: 5, 6, 10, 11, 26, 43, 128, 140, etc. with 14 prize cards of 20 basketed birds. Limoges : 198 old birds: 1, 2, 3, 5, etc. provincial: 2, 3, 14, 60 etc. 14 birds entered, 8 prize cards. Chateauroux : 540 yearlings: 1, 2, 3, 4, 6, 7, 9, 10, 11, 12, etc. provincial against 6,334 birds he started with 1, 9, 22, 27, 62, 79, 85, 93, 99, etc. 18 birds were basketed from which 16 birds won prizes. Montauban : 71 old birds: 1 and 13. National 6,711 birds: 5 and 613. 2 birds entered and 2 prize cards! provincial against 1,600 birds he started with positions 2 and 8. Eight birds were basketed . . . and all of them won prize cards. Limoges : 174 old birds: 1, 7, 9, 10, 16, etc. From 12 basketed birds 10 won prize cards. Bourges : 363 yearlings: 1, 2, 10, 32, 38, 56, 88, 122. National he started with 1st and 6th against 13,116 yearlings!! 9 prize cards out of 16 entered birds. 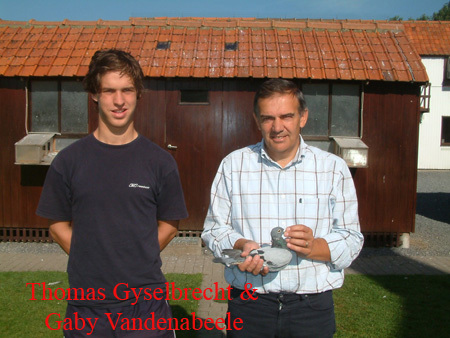 Gaby Vandenabeele is maintaining his position in the world-wide top of pigeon racing for about twenty years now! Birds that win big on 1,800 meters a minute races do not speak to his imagination. According to Gaby, any bird can win with those kinds of circumstances. Racing top with headwinds, . . .on distances from 100 until 800 km; those are the birds he wants! Schaerlackens is a top fancier who is at the absolute top just as long as Vandenabeele. He says: 'A bird that wins a 1st prize with tailwinds and high velocity are privileged for me. They prove they are blessed with the most important quality a pigeon needs; a good sense of direction. Pigeonsport is complex; what is wisdom? ?